Yeast, the tiny plantlike microbe that's been used in making bread and alcoholic beverages for thousands of years, may soon help tame the scourge of malaria, a disease first described in the Fourth Century BCE by Hippocrates. A strain of yeast has been genetically engineered to synthesize artemisinic acid, the immediate precursor to the super-antimalarial drug artemisinin. The work was accomplished by a team of researchers with Berkeley Lab, the University of California at Berkeley, the California Institute of Quantitative Biomedical Research (QB3), and Amyris Biotechnologies, Inc.
Jay Keasling, a bioengineer and leading authority on synthetic biology, heads a research effort to produce antimalarial drugs from microbes, to make them affordable to the populations that need them most. The research team worked under a $42.6 million grant from the Bill and Melinda Gates Foundation to the Institute for OneWorld Health, a San Francisco-based nonprofit pharmaceutical company, and was led by bioengineer Jay Keasling. Having created a strain of Saccharomyces cerevisiae capable of producing high levels of artemisinic acid, the team will use chemical means to synthesize the artemisinin antimalarial drug at potentially far lower costs than extracting the drug from Artemisia annua, the sweet wormwood tree. "Given the existence of known, relatively high-yielding chemistry for converting artemisinic acid to artemisinin or any other derivative that might be desired, microbially produced artemisinic acid is a viable source of this potent family of antimalarial drugs," says Keasling. "Upon optimization of the product, a conservative analysis suggests that artemisinin combination therapies could be offered significantly below their current prices." Keasling is the director of Berkeley Lab's Physical Biosciences Division and leader of its Synthetic Biology Department. He is a professor of chemical engineering and bioengineering at UC Berkeley, director of the University's Synthetic Biology Center, a faculty affiliate with QB3, and a founder of Amyris Biotechnologies. In 2003, Keasling and his research group announced that they had genetically engineered Escherichia coli bacteria to produce another artemisinin precursor, amorphadiene. Recently, when the gene in the wormwood plant that's responsible for converting amorphadiene into artemisinic acid was identified, they switched their focus to yeast. The gene was much easier to introduce into yeast than bacteria. "We still plan to transfer the gene to E. coli. 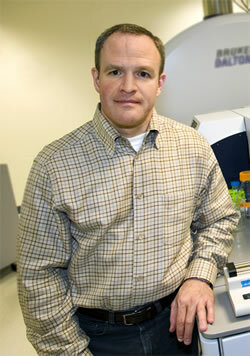 However, given how productive and easy yeast has been, we may stay with yeast," Keasling says. "Having the option of being able to work with either yeast or bacteria gives us more flexibility and a better chance of achieving our goal of complete artemisinin synthesis in the microbe." For all the efforts that have gone into malaria research and treatments, the disease continues to persist. According to the World Health Organization, each year nearly 500 million people living in the tropics and subtropics become infected with malaria, suffering burning fever and severe pain. An estimated one to three million victims die, most of them children. The disease has been impossible to eradicate because of the complex life-cycle of Plasmodium falciparum, the parasite that carries it. 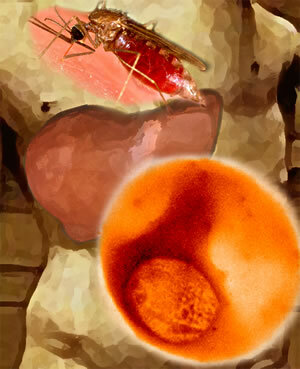 Plasmodium protozoa, the causative agent of malaria, are transmitted through the bite of an infected Anopheles mosquito into a human host. Once the Plasmodium parasite enters the bloodstream of its human host, it travels straight to the liver, where it is shielded from any counteraction. Inside the liver, the parasite replicates itself many thousands of times and is then released back into the bloodstream in a form that invades red blood cells, where it feeds on iron-rich hemoglobin and multiplies. After injection by infected mosquitoes, malaria parasites develop first in the liver and then in red blood cells, where they accumulate iron (shown here in an x-ray image taken at Berkeley Lab's Advanced Light Source). The parasites are vulnerable to oxygen-based free radicals released by the powerful but scarce antimalarial drug known as artemisinin. Medical researchers have been unable to stamp out malaria, but effective antimalarial drugs have been discovered. The best of these is artemisinin and its derivatives, which are nearly 100 percent effective against all known strains of malaria. Artemisinin releases high doses of oxygen-based free radicals that destroy the Plasmodium parasite while it is inside a red blood cell. More than a million malaria patients have already been cured by artemisinin. But the cost of extracting the drug from wormwood trees, which only produce artemisinin under a narrow set of agricultural and climatological conditions, or of manufacturing it entirely through chemical synthesis, is so high that the impoverished populations suffering the most cannot afford it. Keasling's goal is to engineer a microbe to perform as much of the chemistry required to produce artemisinin as possible in order to reduce production costs. Currently, treatment with artemisinin runs at about $2.40 per dose. Keasling aims to cut this down to about 25 cents per dose. "We have probably done about as much chemistry as we can do in the microbe; the rest is going to be chemical synthesis," Keasling says. "While we still have to raise artemisinic acid levels, I feel we've got all the pieces for microbially-sourced artemisinic acid in place and are on track to have a therapeutic drug out the door within two to four years." Engineering the yeast was a three-step process. First the researchers created a new metabolic pathway in the microbe, similar to the one created in E. coli in 2003 to produce amorphadiene. Next they introduced bacterial and wormwood genes into the yeast's DNA, which interacted with the yeast's own genes to produce amorphadiene. Finally, they cloned the gene from the wormwood tree that produces the enzyme P450, which the plant uses to convert amorphadiene to artemisinic acid, and then expressed it in the amorphadiene-producing yeast strain. According to the World Health Organization, each year nearly 500 million people become infected with malaria, and nearly three million, mostly children, die from it. 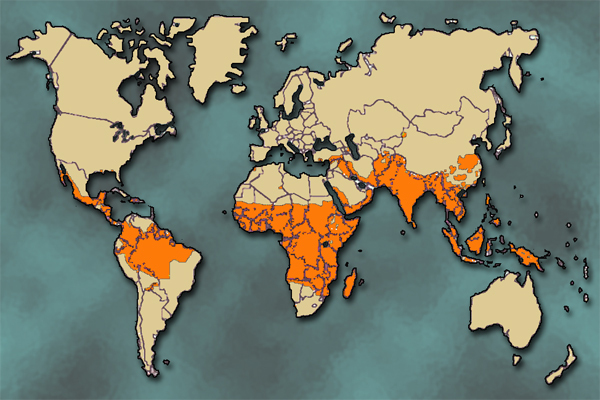 Areas around the world facing the greatest risk, shown reddish brown, harbor some of the world's most impoverished people. "The synthesized artemisinic acid can be transported out and retained on the outside of the engineered yeast," says Keasling. "This means that a simple and inexpensive purification process can be used to obtain the final product." In addition to cost savings, Keasling and his colleagues believe that microbial-sourced artemisinin will offer other advantages over extracting the drug from the wormwood tree. For example, the process will not be subject to factors like weather or political climates that may affect plant cultivation. Furthermore, whereas artemisinin is currently produced in some places by a diesel-fuel purification process that may retain toxic impurities in the final product, artemisinic acid from a microbial source can be extracted using an environmentally benign process. With support from the Gates Foundation, Keasling and his Berkeley research group will work with collaborators at Amyris to develop processes that will yield large quantities of microbial artemisinic acid. To ensure affordability in the areas where antimalarial drugs are most needed, UC Berkeley has issued a royalty-free license to both Amyris and OneWorld Health to develop the technology to treat malaria. Amyris will transform the Keasling group's research into a robust fermentation process and perform the chemistry and scale-up necessary to bring the drug to market. OneWorld Health will conduct preclinical studies and implement a global access strategy for the drug. In addition to the Gates Foundation the work was supported by the Akibene Foundation, the U.S. Department of Agriculture, the UC Discovery Grant Program, the National Science Foundation, and the Diversa Corporation. Results of this research were reported in "Production of the antimalarial drug precursor artemisinic acid in engineered yeast," by Dae-Kyun Ro, Eric M. Paradise, Mario Ouellet, Karl J. Fisher, Karyn L. Newman, John M. Ndungu, Kimberly A. Ho, Rachel A. Eachus, Timothy S. Ham, James Kirby, Michelle C. Y. Chang, Sydnor T. Withers, Yoichiro Shiba, Richmond Sarpong, and Jay D. Keasling, appearing in the 13 April 2006 issue of Nature (pdf).